The town center of Cairo, seen from the Cairo tower. A map of Egypt. 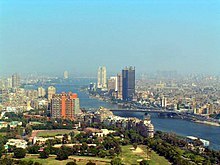 Cairo is the light green spot. ↑ ᱑.᱐ ᱑.᱑ ᱑.᱒ Hedges, Chris. "What's Doing in Cairo," New York Times. January 8, 1995. ↑ Beeson, Irene. "Cairo, a Millennial," Saudi Aramco World. September/October 1969, pp. 24, 26-30.